The construction of the Georgian houses at Merrion Square began in 1762 and continued for 30 years. The earliest plan of the park shows a double line of trees around the perimeter which was later enclosed by railings in the early years of the 19th century. A 'Jardin Anglaise' approach was adopted for the layout of the park with contoured grass areas, informal tree clumps, sunken curved paths and perimeter planting. Merrion Square soon became a fashionable address for the aristocracy and the professional classes. The park was purchased from the Pembroke Estate by the Roman Catholic Church in 1930 for 100,000 as a site for a cathedral. However, this project never materialised and in 1974 the then Archbishop, Dermot Ryan, transferred the 4.75 hectares (11.7 acres) to Dublin Corporation for use a public park. 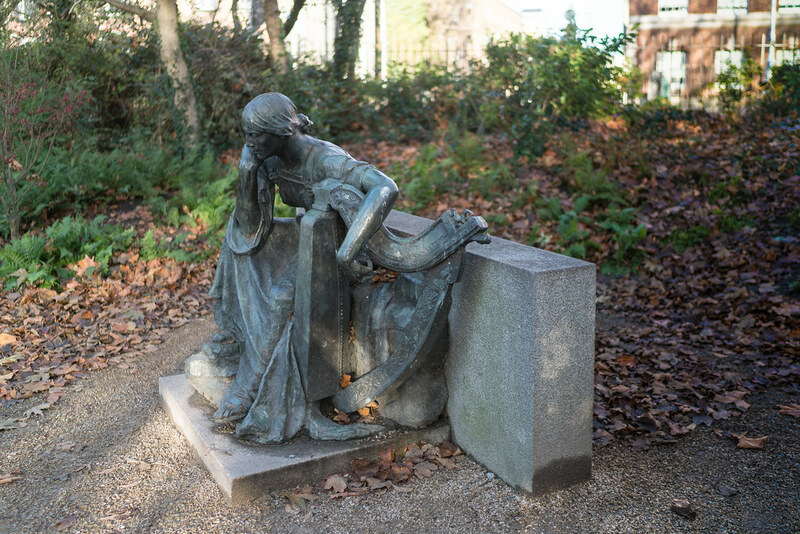 Notable features of the park include many fine sculptures; the Rutland Memorial; a collection of old Dublin lamp posts; a central floral garden; heather garden and playground. What was once the preserve of local privileged keyholders is now a public park to match the best in Europe and a successful adaptation of a typical Georgian Square to modern intensive public usage. 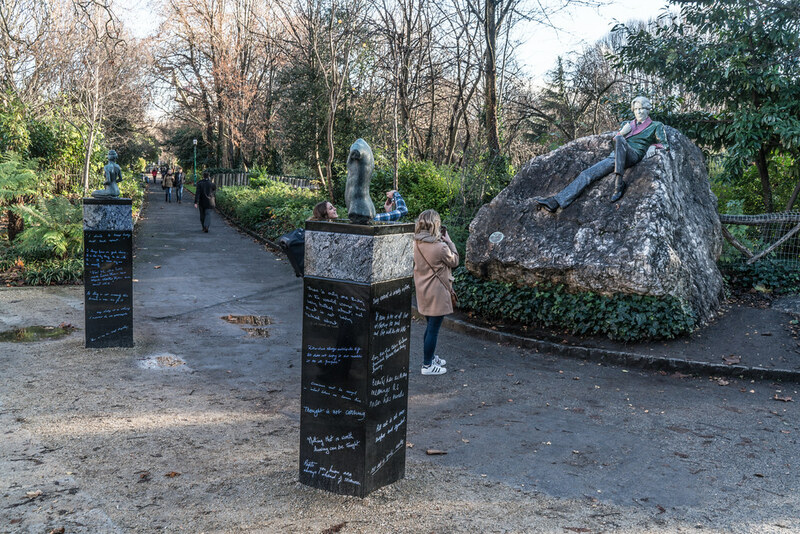 The current landscape works being implemented in Merrion Square Park have been informed by a Conservation and Management Plan for the Park which was completed in April 2014 and also a tree survey of the park undertaken in 2012. The tree survey indicated that a large number of trees in the park were self seeded Sycamores and also poor quality trees planted too close to the crown spread or even under the crowns of the mature trees . Instead of contributing to the overall planting structure they masked and impacted negatively on the historic specimen trees eg. London Planes, Limes (Tilis sps. ), Norway Maple (Acer platanoides ), Holm Oak ( Quercus ilex). Over the last 3 years a programme of selective removal of the poorest quality and inappropriately planted trees has been undertaken to enable the remaining trees to grow to their potential and also to facilitate works recommended in the Conservation Management Plan. The Conservation and Management Plan was undertaken by Grade 1 Conservation Architects, Howley Hayes & Associates and recommends a range of works in keeping with best practice for the conservation and management of a significant Georgian Square. Implementation of these recommendations commenced with the restoration of the perimeter path which necessitated the removal of trees and undergrowth, much of which were growing on the actual line of the old footpath. The current tree removal, by reducing competition from poorer quality trees and excessive undergrowth, will enhance the longevity and condition of the mature trees, many of which are in excess of 100 years old. As part of the park improvements it is also proposed to undertake appropriate replacement tree planting, thus complimenting the existing mature trees and creating a sustainable tree canopy for future generations. Prior to finalising the Conservation and Management Plan consultation was undertaken with local stakeholders including the Merrion Square Innovation Group who are supportive of the plan.